So, I spent a couple of hours signing Dream Boats posters at the ALA Midwinter in Seattle this past weekend and met a lot of wonderful librarians, student librarians, teachers, authors, publishers, book bloggers*, and fellow illustrators from all across the US and Canada (and one from as far away as Samoa!). There was a lot of interest in the Dream Boats illustration process which I tried to explain as much as possible, but I also referred quite a few people to this website to learn more. Now if this was a Murphy’s law sort of scenerio, it would be the perfect time for my website to go down. Which it did, sort of. Well, more like became unreachable at its usual address. The easiest way to explain it is there was a catastrophic failure with the host of my other websites. The subsequent moving of sites, moving of domains, reassigning of DNS’s and other acronyms rendered this site invisible at its usual address – it’s like someone changed the house numbers, and the house disappeared. Not really the most opportune time for this sort of thing to happen – so I can only hope that those interested in learning more about the book will attempt to look me up again and find the site in working order – which should happen once the servers finish considering and digesting all the changes. Following are a few really poor cellphone photographs I took really quickly. So…blurry. 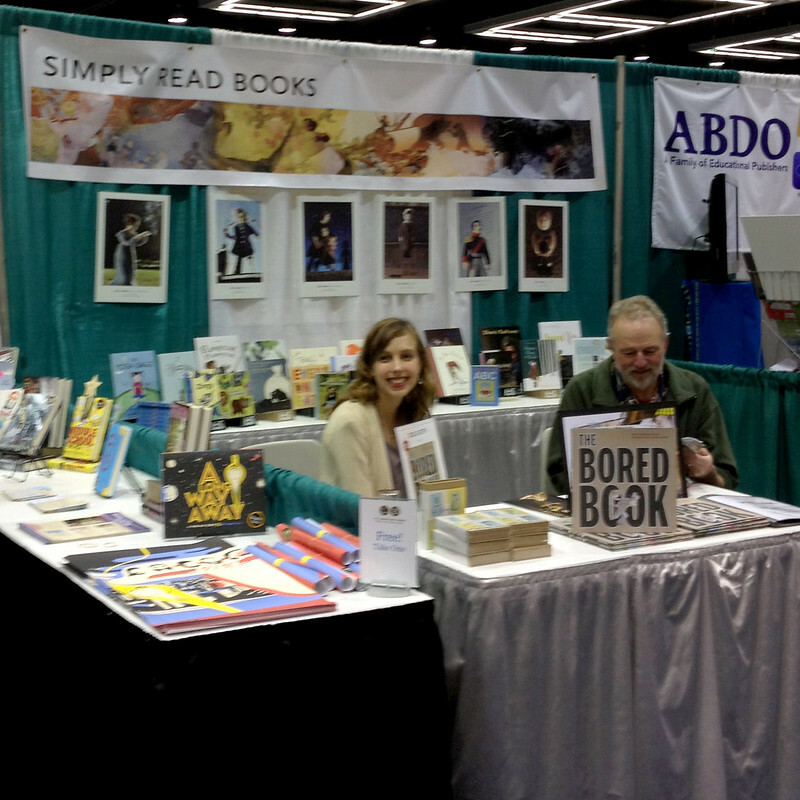 Kallie George, Editor at Simply Read Books (and also an author), and Doug Keith, illustrator of The Bored Book, at the Simply Read Books booth. 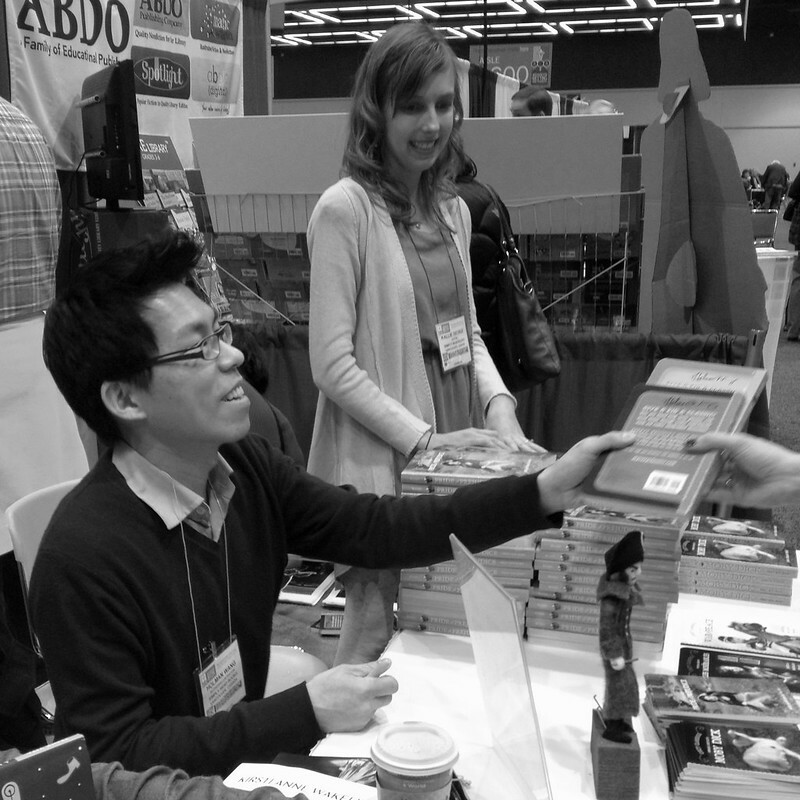 This is Holman Wang, half of the Cozy Classics duo, signing books for a very enthusiastic lineup of classic literature/needle felt fans.